A group of researchers led by the Universitat Autònoma de Barcelona (UAB) has discovered the first scientific evidence of genetic blending between Europeans and Asians in the remains of ancient Scythian warriors living over 2,000 years ago in the Altai region of Mongolia. The Altai is a mountain range in Central Asia occupying territories of Russia and Kazakhstan to the west and of Mongolia and China to the east. Historically, the Central Asian steppes have been a corridor for Asian and European populations, resulting in the region’s large diversity in population today. In ancient times however the Altai Mountains, located in the middle of the steppes, represented an important barrier for the coexistence and mixture of the populations living on each side. And so they lived isolated during millennia: Europeans on the western side and Asians on the eastern side. At the UAB palaeogenetic laboratory researchers analysed mitochondrial DNA (inherited from the mother, it allows us to trace our ancestors) extracted from the bones and teeth of 19 skeletons from the Bronze Age (7th to 10th century BCE) and from the Iron Age (2nd to 7th century BCE) from the Mongolian Altai Mountains. The remains were extracted from the tombs discovered seven years ago, in which the skeletons of Scythian warriors were discovered and which represented the first scientific evidence of this culture in East Asia. The results obtained demonstrate that the population from the Iron Age, corresponding to the time when the Scythian culture resided in the Altai Mountains, had a perfect blend (50%) of European and Asian mitochondrial DNA lineages or sequences. The discovery is relevant, taking into account that previous populations showed no signs of lineage mixture: the DNA analysed in the tombs located in Russia and Kazakhstan belong to European lineages, whereas DNA from the eastern part, in Mongolia, contain Asian lineages. “The results provide exceptionally valuable information about how and when the population diversity found today in Central Asian steppes appeared. They point to the possibility that this occurred in Altai over 2,000 years ago between the local population on both sides of the mountain range, coinciding with the expansion of the Scythian culture, which came from the west”, explains Assumpció Malgosa, professor of Biological Anthropology at UAB and coordinator of the research. The current research is the first to offer scientific evidence of this population mixture on the eastern side of the Altai and indicates that the contact between European and Asian lineages occurred before the Iron Age when populations were present on both sides of the mountain. From 2005 to 2007, UAB researchers worked jointly with French and Mongolian researchers in a European project to excavate Scythian tombs in Mongolia’s Altai Mountains. In the three excavation campaigns carried out over twenty tombs were excavated. Many of them were frozen and contained mummified human remains of warriors buried with their possessions and horses. This was the first time Scythian warrior tombs had been discovered in Mongolia, since all other tombs previously found had been located on the western side of Altai. The Scythians were an Indo-European people dedicated to nomadic pasturing and horse breeding. They crossed the Eurasian steppes from the Caspian Sea until reaching the Altai Mountains during the 2nd and 7th century BCE. The Scythians are known most of all thanks to ancient texts written by the Greek historian Herodotus. Image above: A Scythian mummy on display at the Hermitage Museum in St. Petersburg, Russian Federation. 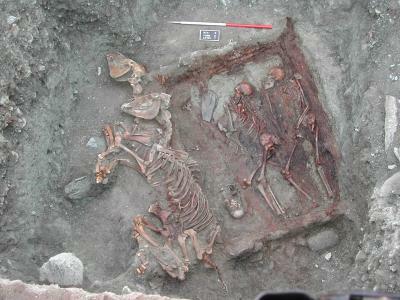 IMAGE: This shows Scythian warrior tombs found in the Altai region of Mongolia.Click here for more information.